On wednesday June 8 2011, I was part of a group of scientists from TNO, Utrecht University and the International Space University (ISU) to perform a series of experiments on-board a zero gravity flight campaign flown with an Airbus A300 from Novespace above the Atlantic ocean. The aim of the experiments was to improve our insight in how the brain combines information from different sensory systems (e.g. vestibular and visual system) into an integrated percept of self-motion and spatial orientation, under the influence of gravity levels. In other words, we flew a number of parabolas under Lunar gravity (1/6 g), Martian gravity (1/3 g) and zero gravity conditions and performed visual tasks. What I felt during the tests was that Lunar gravity felt very much like zero gravity, and that Martian gravity in a way was a light version of Earth gravity but similar. 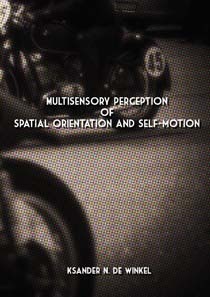 An observation that is now also scientifically assessed in Ksander de Winkel's PhD thesis called 'Multisensory perception of spatial orientation and self-motion' (pdf), which he successfully defended in Utrecht on March 13, 2013. Some light background reading from the time we did the experiments can be found here.